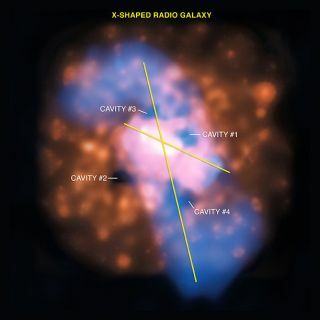 This X-ray image of hot gas in and around 4C +00.58 reveals four different cavities -- regions of lower than average X-ray emission -- around the black hole. These cavities come in pairs: one in the top-right and bottom-left (labeled cavities #1 and #2 respectively), and another in the top-left and bottom-right (labeled cavities #3 and #4 respectively). Special processing was applied to this image to make the cavities more obvious. Thediscovery of a giant, spinning black hole that has been knocked off its axistwice has led astronomers to suggest that a violent galaxy collision caused thestrange cosmic behavior. "Wethink that this black hole has quite a history," said astronomer ChristopherReynolds of the University of Maryland, a co-author in the black hole study. "Not once, but twice, something has caused this black hole to change itsspin axis." Inthis new study, scientists detected the change in the black hole's axis usingthe latest data from NASA's Chandra X-ray Observatory. The likely cuprit: Acatastrophic collision between two galaxies. [Photo of the askew black hole]. Thegalactic smash-up is thought to have altered the axis of the spinning black hole.But unlike another recent study, in which colliding galaxies may have created recoiling black holes, this particular black hole was not moved by thecrash ? only its spin changed. Theblack hole find emerged from extensive observations by astronomers of a galaxyknown as 4C +00.58, which is located approximately 780 million light-years fromEarth. Like many galaxies, a supermassive black hole resides at the heart of 4C +00.58. Thisparticular black hole is actively pulling in large amounts of gas, which isswirling around and forming a disk around the object. The jumbled magneticfields within the disk generate strong electromagnetic forces that propel someof the gas away from the disk at high speed, producing bursts of radio jets. Buthere's where it gets strange. Aradio image of 4C +00.58 shows a bright pair of jets that point from left to right, and a fainter, more distant line ofradio emission that runs in a completely different direction. Scientistsclassify this type of galaxy as "X-shaped," because of the outline oftheir radio emission. "Wethink this is the best evidence ever seen for a black hole having been jerkedaround like this," said the study's lead author Edmund Hodges-Kluck of theUniversity of Maryland in College Park, Md. "We're not exactly sure whatcaused this behavior, but it was probably triggered by a collision between two galaxies." Thenew observations allowed astronomers to infer the possible mechanisms behindthe 4C +00.58 system, and possibly others that may be similar. Chandra'sX-ray image revealed four separate cavities around the supermassive black hole.These cavities come in pairs: one in the top-right and bottom-left, and anotherin the top-left and bottom-right. Basedon the orientation of the radio jets, the complicated geometry that wasrevealed by the Chandra image could explain what happened to the system's blackhole, as well as the galaxy itself. Theresearch is detailed in a recent edition of the Astrophysical Journal Letters. Hodges-Kluckand his colleagues think that the original spin axis of the black hole ranalong a diagonal line from top-right to bottom-left. Following a collision witha smaller galaxy, a jet powered by the black hole then ignited, blowing away surroundinggas to form cavities in the hot gas to the top-right and bottom-left. Inthis scenario, since the gas falling onto the black hole was not aligned withthe black hole's spin, the axis of the black hole rapidly changed direction,causing the jets to point in a roughly top-left to bottom-right orientation.This, in turn, created other cavities in the hot gas, and radio emissions inthis new direction. Finally,either a merger of the two central black holes from the colliding galaxies, ormore gas falling onto the black hole, caused the spin axis to get moved to itspresent direction, which is roughly left to right. Thesetypes of changes to the angle of the spin of supermassive black holes havepreviously been suggested as a way of explaining X-shapedradio galaxies. But so far, noconvincing case has been made for any individual object ? perhaps until now. "Ifwe're right, our work shows that jets and cavities are like cosmic fossils thathelp trace the merger history of an active supermassive black hole and thegalaxy it lives in," said Hodges-Kluck. "If even a fraction ofX-shaped radio galaxies are produced by such "spin-flips", then theirfrequency may be important for estimating the detection rates withgravitational radiation missions."